Lionel Messi, 2014 World Cup: The world’s best player has figured out how to win matches by moving less than everyone else. Lionel Messi has figured out how to win matches by moving less than everyone else. Lionel Messi moves with the ball during the Argentina–Switzerland World Cup match on July 1, 2014. SÃO PAULO—It’s coming toward the end of halftime at the Corinthians Arena and the big screen is showing Lionel Messi standing in the tunnel. Like everyone else within a mile radius, Messi can hear Pharrell blasting from the stadium speakers, but he doesn’t look happy. Javier Mascherano is by his side, talking urgently. Messi gives an absent nod and adjusts his captain’s armband. The other Argentina players look pensive as they file past on their way back to the pitch. What’s been going on back there? Whatever it was, it doesn’t look like it was much fun. But then neither was the 45 minutes of football that preceded it for Argentina or any of its thousands of supporters. The power dynamic in that Argentina dressing room has been one of the most gossiped-about themes of the World Cup. The word is that the team is living under the dictatorship of Messi. People say the coach, Alejandro Sabella, is a puppet whose job is to interpret the dictator’s will—a task complicated by the fact that the dictator hardly ever speaks. 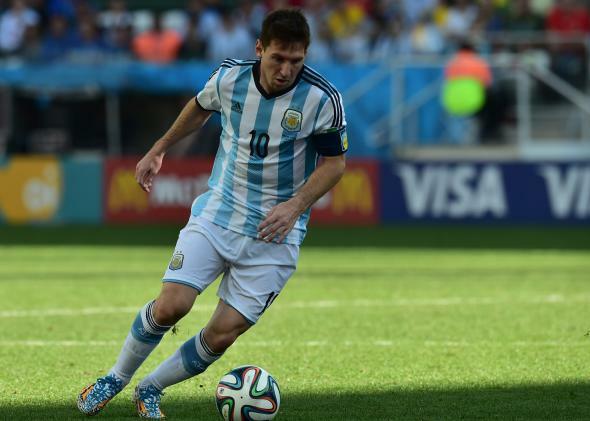 Rumor has it Sabella communicates with Messi through intermediaries: Mascherano, Fernando Gago, and Sergio Agüero. Now the team is suffering. Switzerland is fighting hard. The Brazilian fans in the stadium have been mocking their ponderous play. Is Argentina’s World Cup about to end in ignominy? Ninety minutes later, Pablo Zabaleta is standing in the mixed zone giving thanks to God. Zabaleta won the World Youth Championship alongside Lionel Messi in 2005. At that time they both lived in Barcelona, where they “spent three years as friends, going out. … Yes, they were very good times.” Zabaleta knows Messi about as well as anyone in the game. Yet when he speaks about his old friend after the win over Switzerland, he uses the awed tones a cult member reserves for the leader. We are so lucky to have Messi in Argentina? Footballers do not usually gush about each other like this, but Zabaleta keeps laying it on thick. Messi hadn’t actually scored the goal this time, but he had created the winner for Ángel di María with an inspired dribble and pass in the 118th minute. He had just picked up his fourth man-of-the-match award in four World Cup matches. Argentina lives to fight another day. No wonder Zabaleta sounds grateful. Messi’s dribble has had the side effect of ending the career of one of football’s greatest managers. Now, Ottmar Hitzfeld is giving the last press conference of his 30-year coaching career. In the press room, Swiss journalists are complaining that their side only started playing football in the 119th minute, after going 1–0 behind. A fairer reading would be that Hitzfeld’s spoiling tactics were almost a brilliant success. The Swiss had done exactly what Hitzfeld asked. They swarmed around Messi and shut off his angles, and when he looked likely to get free, they kicked him. “Tactically, they put in a monstrous effort,” Zabaleta said. Argentina’s game plan had begun to look less like an intelligent team unit playing to its greatest strength and more like a collective exercise in buck-passing. An example of what Argentina were missing could be seen here after about 65 minutes, when Mascherano rolled the ball 5 yards to Messi, then stood and watched as the captain tried and failed to dribble past two opponents. Messi is the best player in the world, but even he can’t be expected to consistently come out on top when it’s one against two. When a teammate gives him the ball at Barcelona, he immediately shows for the return pass. With Argentina on Tuesday, teammates gave him the ball, then waited to see what he would do with it. It was as though some of them felt they weren’t worthy to combine with him. Too much deference, not enough teamwork. You could almost have said there were three teams out there: Switzerland, Argentina, and Messi. As you watched this curious three-way match, it gradually became apparent that the third team was playing the game at a radically different pace. Surely it must mean something that the best player in the fastest-ever era of football hardly ever runs at all. If Messi on the ball is the greatest spectacle in the game, Messi off the ball is one of the most mysterious. It’s fascinating to watch him and try to see the game through his eyes. The first thing that strikes you is that, most of the time, he appears to be doing very little indeed. He loiters at an angle to the play. He drifts disinterestedly in the spaces between defenders. The only signs of alertness are those sharp, hawkish swivels of the head, as he stores a mental image of what’s over his shoulder. Then he darts toward empty space—the logic of his movement only becoming apparent two passes later, when the ball arrives at his feet. The wonder is that somehow he exerts this gravitational pull on the play while seldom even breaking into a trot. 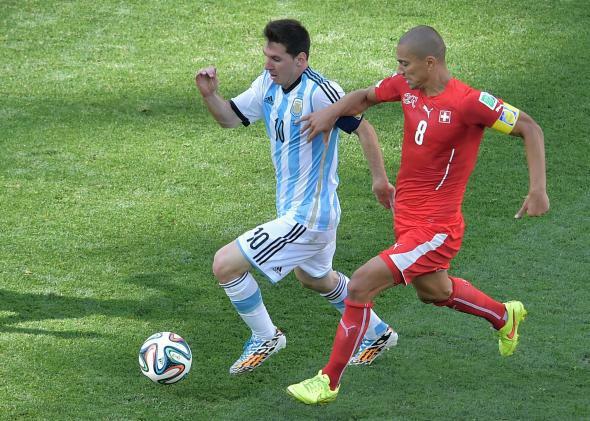 Lionel Messi (left) is challenged by Switzerland’s Gökhan Inler. FIFA’s post-match data confirmed the impression that Messi had expended less energy to exert more influence than anyone else on the field. He moved 10.7 kms in 130 minutes of game time, meaning he covered less ground than any other outfield player who completed the match. He also spent less time engaged in medium- and high-intensity activity than any other outfielder. And his 31 sprints were fewer than any other outfielder who completed the match except Federico Fernández and Fabian Schär, who are both central defenders. Compare these figures with those of other star forwards in the second round. When Brazil beat Chile on penalties, Neymar ran almost 3 kms more than Messi did against Switzerland. He spent 21 minutes in medium- or high-intensity activity, compared with Messi’s nine. He completed nearly twice as many sprints—57 to 31. And despite this frenetic physical output, he barely figured in the latter stages of the game. Thomas Müller’s numbers from Germany’s win over Algeria tell a similar story: 20 minutes of medium- or high-intensity running, 56 sprints, and nothing like Messi’s decisive impact. No doubt Messi’s economy of effort was part of the reason why he had the strength, in the 118th minute, to accelerate beyond the exhausted challenge of Schär and roll that precise assist into the path of di María. Messi’s run to set up the goal was clocked at 27.58 km/hr, and it was the fastest he had moved in the match. To say that Messi limits his running because he wants to save his energy for when he really needs it is probably true, but misses a larger point. Lots of players know how to pace themselves. Only Messi has figured out how to win matches by moving less than everyone else. While the others are running just to keep up, Messi only has to walk to stay one step ahead. When the whistle went at the end of 90 minutes in the Switzerland match, Messi was one of the last Argentina players to join the gathering on the sideline by the dugout. He poured a bottle of water over his head and rubbed the nape of his neck. Although he is officially the captain—and allegedly the dictator—he made no apparent attempt to address his teammates. When the Argentina players huddled before the start of extra time, it was Sabella, then Mascherano, who did the talking. Messi just looked like one of the boys. At that moment, you realized how absurd it is that an accident of birth and geography has meant that Messi has spent his whole life being compared to Diego Maradona. The two of them are so different that to compare them is pointless. It’s like arguing about whether Jimi Hendrix was better than Kraftwerk. Maradona was a histrionic virtuoso, a footballing telenovela; everything he did was an extrovert emotional extravaganza. He would have been going around that huddle pumping his fists, clutching teammates’ heads to his chest, promising them they were going to win and leading the singing afterward when they did. Messi is an impassive minimalist whose face barely changes even when he’s bouncing on the ground after getting kicked. Everything is pared back, nothing is wasted; he is the greatest exponent of less-is-more efficiency the game has seen. He’ll never give Argentina the kind of emotional leadership Maradona did. It’s simply not in his nature. But to see him accelerate past Schär and play in di María was to see leadership by example in its purest form. The real Lionel Messi has turned up at the World Cup, that question has been answered. The question now for Argentina is how many of his teammates will have the courage to join him.